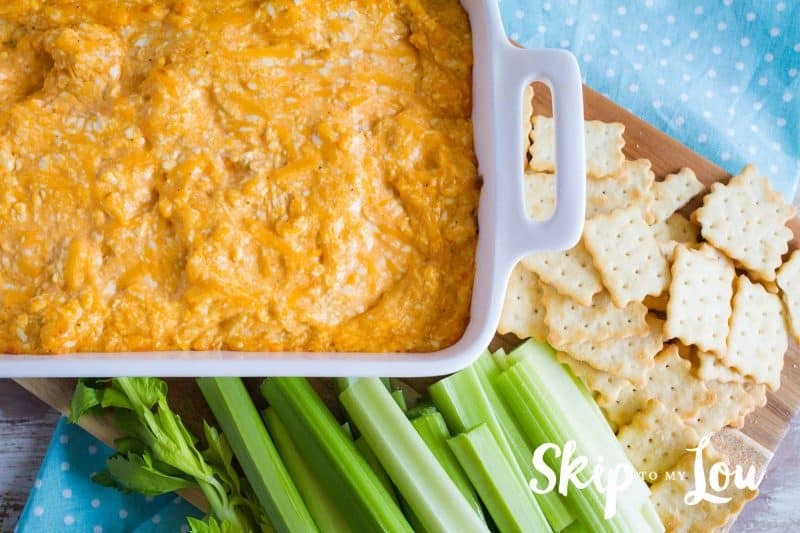 Home » Recipes » Buffalo Chicken Dip and Honey Glazed Pretzels Super Bowl Faves! Buffalo Chicken Dip is one of my family’s all time favorites. I am constantly asked for the recipe, and when I am bringing a dish to share at different parties, this one is often requested! Luckily it is super easy to make, so I never mind whipping it up for a party. If you love that delicious buffalo chicken flavor you will love my Instant Pot Buffalo Chicken Sandwiches (this recipe can also be made in the Crock Pot). When it is football season, or if you are just having a house full of guests, it is time to get thinking about some easy crowd pleasing foods! People love finger foods. They want something easy that they can quickly grab and not miss a minute of the action! Here are a couple of recipes that are sure to keep the crowd happy–unless their team is losing–I don’t have a recipe to fix that! Shredded cheese, shredded chicken, ranch dressing (or mix it up and substitute blue cheese dressing) and cream cheese bake up for a hot and bubbly dip. Sprinkle blue cheese crumbles or cheddar cheese on top for a garnish and you are ready for any party. In a pinch use canned or rotisserie chicken to save time. I went ahead and doubled the recipe so you will have plenty for a party! Be sure to make sure you baking dip is large enough. The baked chicken dip is best served hot, but it seems to disappear quickly even when it is cold. The ranch dressing and hot sauce give this dip the traditional “buffalo wing” flavor, but I think the bonus flavor is in the cream cheese. To be fair, I do believe that cream cheese is a bonus that can make any dish better! This buffalo dip tastes amazing. Once you cook the chicken breast, it is easy to shred. Everything else is just measuring sauces and mixing. So easy! It is a recipe that everyone will love! You can whip it up ahead of time and just refrigerate it until you are ready to heat it up and serve! We serve this dip with Chicken in a Biskit crackers, celery and even tortilla chips. 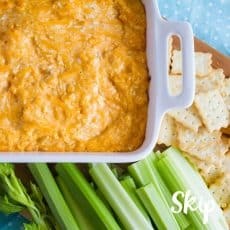 Spicy crowd pleasing baked dip! Soften cream cheese, mix together all ingredients and bake at 350 degrees for about 30 minutes until bubbly. Serve with celery and Chicken in Biskit crackers. 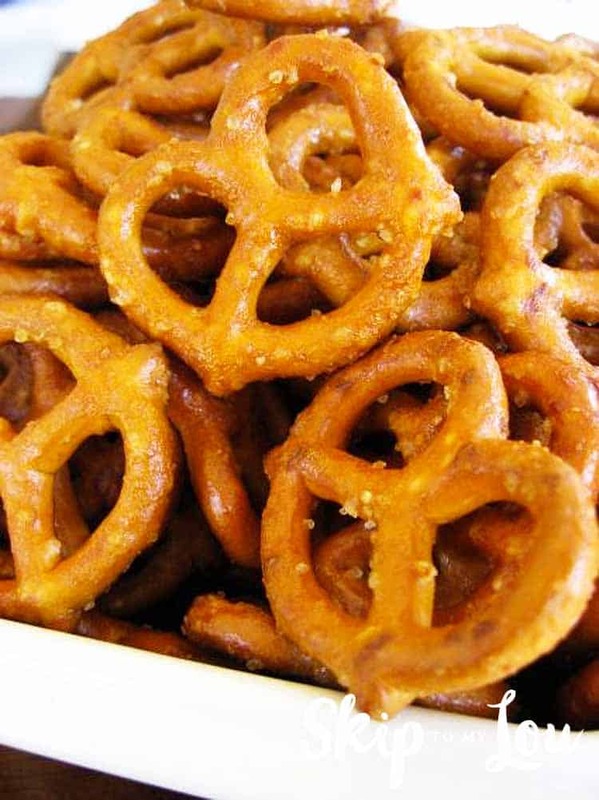 You will want to also whip up a batch of these yummy pretzels. They are always a Super Bowl favorite food! Next up, these lightly seasoned pretzels make a great crunchy snack! These are super easy to make and will jazz up the boring ole pretzel! They are also convenient to place around the football viewing area in little bowls, so no one will have to miss a single play (or commercial) to grab a little snack. Melt butter and mix in other ingredients. Pour over pretzels. Place pretzels in a large pan and bake at 250 degrees for 1 hour, stirring every 15 minutes. Remove from oven and separate pretzels before completely cooling (they have a tendency to stick together while cooling). Need something sweet? Do I even have to ask? You might try this chocolate chip cheesecake dip or monster cookie dip. I promise they will be the first to go! 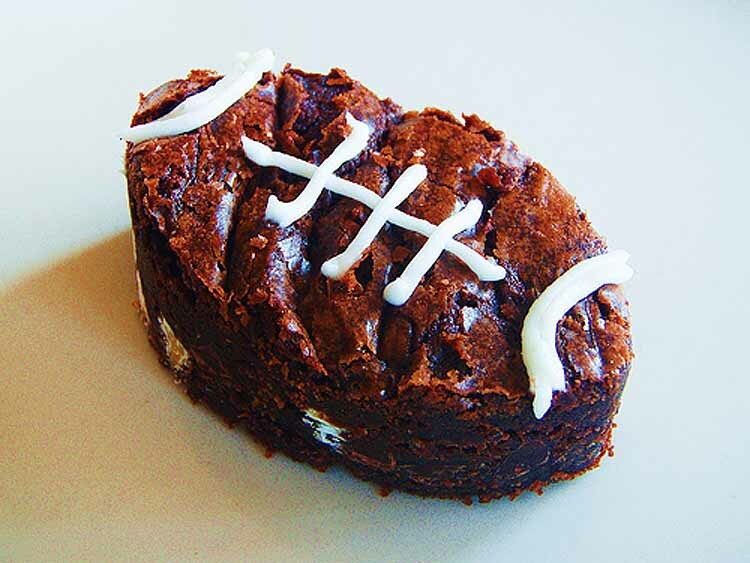 Take your favorite brownie and cut into football shape with a football cookie cutter. Let’s be honest here…if you have been cooking and cleaning all day in preparation for a football party, a brownie mix will be perfectly suffice for this treat. Add some white frosting details and you have a simple and cute sweet treat! The fact that your brownies are in the shape of footballs and have icing piped on them, is enough to make any brownie mix taste fabulous! But, if you have just a little extra time, and you are going for the big win, check out Cookies & Cheese she made Ina Garten’s Outrageous Brownies for her footballs. You might like this Super Bowl Panini Party Recipe from last year. Have a fun Super Bowl! I hope that your team in victorious. Unless they are playing against my team, then I just hope that your party is wonderful! Enjoy! 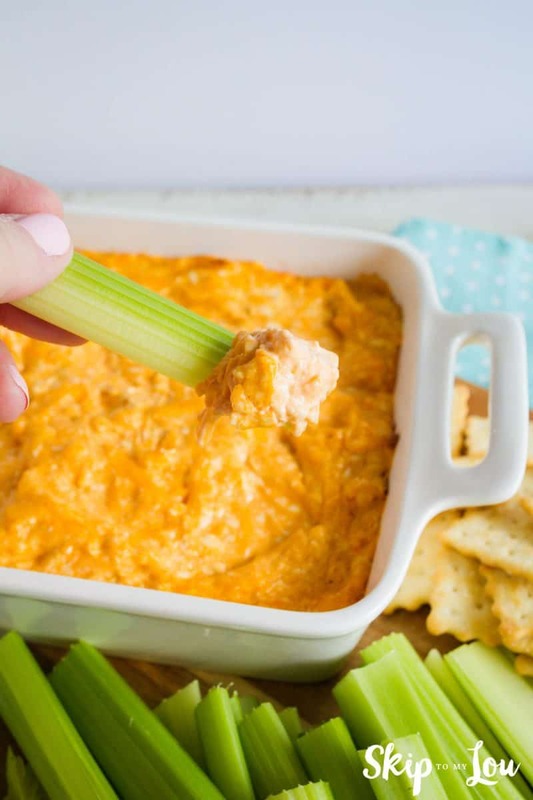 I hope you will agree this buffalo chicken dip is the perfect dip for any party! Can I leave out the hot sauce? I think the hot sauce is needed to give it buffalo flavor. If you want a creamy dip with meat... try this: 1 block cream cheese, 1 pound ground sausage (the tube) browned and drained, and a can of Rotel. Heat it up and mix it all together. AMAZING! I have been thinking about the buffalo dip since I saw your post last week. It looks soo good! I keep trying to find an excuse to go to the grocery store just so I can buy the ingredients. Cant wait to try it! Nicole it is delicious! A real crowd pleaser. These look super, Cindy. I didn't get to use them this go-round, but I'm earmarking them for future use... YUM. I love to do this dip with blue cheese dressing and crumbles and serve it with Frito Scoops for a change of pace. Its also a great party food--Never fails to come home with an empty dish! Denise, love the idea of blue cheese crumbles on the top! YUM! My fiance's mother has been looking for a good buffalo dip! I am going to have to give this to her and let her try it out. She is totally not a chef, but this seems easy as 1-2-3. I've made that spicy buffalo dip, but it was a little thick and with larger chunks of chicken! I served it with tortilla chips and it was delicious! They both look easy and yummy. My husband says goopy food is the best kind of man food! Yum! I wish I hadn't already gone shopping for the big day. Hmmm...my husband wants to have people over for the Daytona 500...definitely will be on the menu! Combine first 10 ingredients in a jar, cover tightly and shake vigorously. Set marinade aside. Cut the cheese in half lengthwise then crosswise into ¼ inch thick slices. Arrange cheese, by alternating slices in a shallow baking dish. Pour marinade over cheese, cover and chill for at least 8 hours. Serve with bread, toast or crackers. I LOVE this dip! Thanks for posting the recipe- I always just guess and it is never as good as yours! YUM! Where can you buy the Louisiana hot sauce? Sounds delish! Both of these sound good....and that's saying a lot with the morning (aka all-day) sickness! I am GOING to make those pretzels!! Thanks for sharing. Mic together in a crock pot and heat until bubbly. Serve with rye crackers (I like triscuits!). Yum! I agree, I shouldn't read when hungry...actually, I am starving! This is our favorite dip and is always on the menu when we host a party. Bleu cheese is a must though! I will have to try the chicken in a biscuit crackers this time. We always offer celery and wheat thins. Thanks for the tip! I love that buffalo chicken dip. Usually my aunt makes it though and she uses Franks and blue cheese dressing. I think I will make it this time and lighten it up a bit! Thanks for the recipe! YUM! The dip looks great and I bet it is so good with the crackers. Sounds like a yummy combination. Do you have to be watching the Superbowl to enjoy these foods? No? Well then I'm excited because they look delicious! !